Find artworks, auction results, sale prices and pictures of Francois-Marius Granet at auctions worldwide. 70 Attributed to François Marius Granet (1775-1849): An Artist in His Studio Ink and wash on paper, 1811, inscribed 'un dejeuner a l'oeil', dated and inscribed with initials 'TG' lower left, variously inscribed on the reverse, with labels from Kunstmuseum Winterthur. 8 3/4 x 9 in. (sheet), 15 1/4 x 15 1/4 in. (frame). 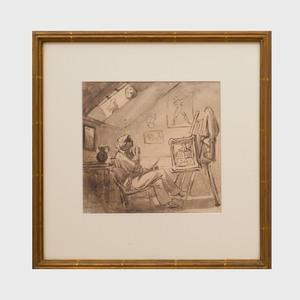 Note: According to labels on the back of the frame, this work was originally attributed to Théodore Géricault and exhibited as such at the Kunstmuseum Winterthur in 1942 and 1953. Originally proposed as an early work by scholars Dubaut and Nathan, it has also been rejected by scholars on stylistic grounds. The most recent attribution has been to François Marius Granet, a student and follower of Jacques Louis David. 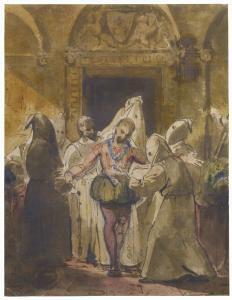 Exhibited: (as by Géricault) Winterthur Kunstmuseum, Winterthurer Privatbesitz, 1942, no. 348; Winterthur Kunstmuseum, Théodore Géricault, 1953, No. 127. Literature: P. Dubaut and P. Nathan, Géricault 1791-1824, Sammlung Hans E. Buhler, Winterthur, 1956., no. 31. Property from the Estate of William Kelly Simpson Provenance:Pierre Cloix; Camentron, Paris; O. Ackerman, Paris; Hans E. Buhler; Hart/Knoll Gallery, London. Condition: A tiny tear at the lower right sheet edge, backed with Japan. The reverse of the upper sheet edge reinforced with Japan. Staining and surface soiling on the reverse. Otherwise in good condition. 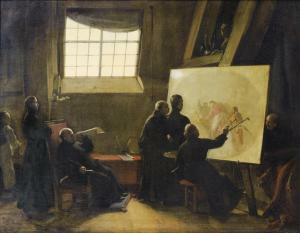 signed illegibly, lower right: Gran..
Granet's main subjects were 'interieurs' and 'ruines'; his interiors of monasteries, cloisters and catacombs, with their strong contrasts of light and shadows, proved particularly popular, and helped to establish his reputation. 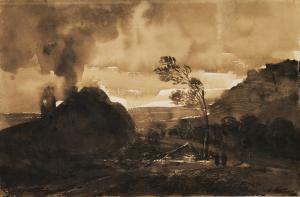 Aside from his landscapes and interiors he also executed a number of historical works, the present watercolour being a notable example. The drawing illustrates an episode in the life of Charles V (1500-1558), Holy Roman Emperor from 1519 to 1556. Charles V, also known as Charles I of Spain was the last emperor to aspire to the medieval ideal of universal empire. He spent several decades fighting against his rival, the King of France. After an abortive last campaign against France, Charles prepared for his abdication, renouncing, in 1555 and 1556, his claims to the Netherlands and Spain. In early February 1556 he moved to the monastery of Yuste, which he had long before selected as his final refuge. He died there eighteen months later. Granet's standing in the artistic community is reflected by the fact that in 1809 Ingres painted a major portrait of him (Aix-en-Provence, Musée Granet), and also made two separate portrait drawings, in 1809 and 1812. Laid down on card which has in turn been hinge mounted. The paper has very slightly discolored and there are some old creases to the sheet as a result of the way in which it has been laid down. The medium is predominantly fresh throughout. Sold in a giltwood frame. In response to your inquiry, we are pleased to provide you with a general report of the condition of the property described above. Since we are not professional conservators or restorers, we urge you to consult with a restorer or conservator of your choice who will be better able to provide a detailed, professional report. Prospective buyers should inspect each lot to satisfy themselves as to condition and must understand that any statement made by Sotheby's is merely a subjective qualified opinion. 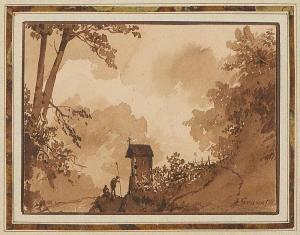 15.7 by 24cm., 6⅛ by 9½in.